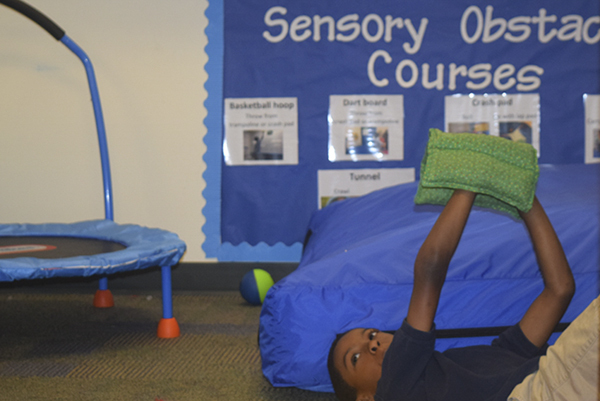 Day’Anah’s recognition that physical activity plays a role in academics has fueled her interest in the learning center’s new movement zone, developed by The Shadow Project. “Many of my students like Day’Anah are starting to gauge what they are feeling, and they know what they need to do to calm down and focus, so they can get back to class,” says Rosa Parks Learning Center Teacher Kim Giarelli, M.S. Kids need regular movement to be successful in school. In addition to the health benefits of physical activity, movement breaks can help students regulate their behavior, and they are then better able to engage in class and retain information. In Ms. Giarelli’s room, students in grades four and five now have access to a stationary bike, a fit board, a trampoline, and a crash pad for timed breaks. In another learning center classroom, students in kindergarten through third grade utilize a weighted lap pad, balance beam, trampoline, crash pad, tunnel for crawling, and squishy balls for shooting indoor hoops.